As the hurricane season takes off in the US so too will drone planes which will fly into the eye of the storms. It is part of an ongoing project funded by the US National Oceanic and Atmospheric Administration (Noaa) to monitor the Earth's atmosphere. The planes will send back a continuous stream of information which researchers say will allow them to predict the intensity of hurricanes. But the remote control planes will not be able to take off from the US. For this year at least, they will embark on their hurricane research missions via the Caribbean island of Barbados because the US Federal Aviation Administration has not given Noaa approval to operate the planes from US territory on safety grounds. Noaa is hoping to launch between two and five flights during this year's hurricane season - which runs for the next six months. The planes can fly into the eye of a storm at just 300 feet above sea level. This means they can monitor the energy transfer from the sea's surface to the storm, a critical improvement on previous methods of monitoring which used 'hurricane hunter' aircraft that flew at around 10,000 feet. 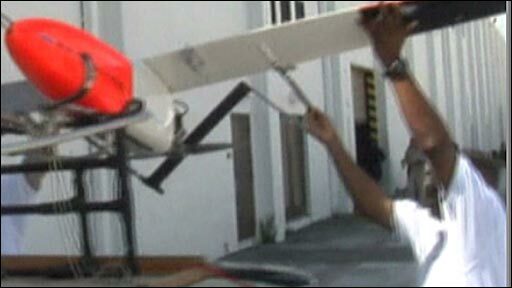 June-October Hurricanes: small unmanned aircraft will fly into the eye of Atlantic and Caribbean hurricanes at low altitudes too risky for crewed aircraft. Late 2008 Arctic climate change: large unmanned aircraft will observe sea ice conditions and track the locations of seal populations as the climate warms. 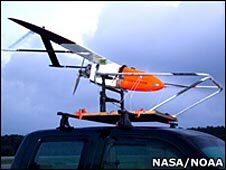 Spring 2009 Storms: low and high altitude unmanned vehicles will fly over the Pacific to study atmospheric rivers. Future missions to monitor fisheries, track Greenland glaciers, preserve natural resources and examine murky plumes of volcanic emissions. They will send back a continuous data stream of information including temperature, pressure, wind and humidity readings. It promises another big improvement over the previous readings scientists have been able to take via instruments flung from planes which took snapshots as they fell through the storm. The remote controlled planes are powered by a 24cc motor and a single propeller and can fly at about 70mph and cover 2,000 miles on a single US gallon of fuel, according to researchers. Noaa announced a $3m (£1.5m) investment into unmanned aircraft in January of this year. As well as predicting the intensity of hurricanes, researchers will also use the planes to track how fast Arctic summer ice will melt and whether Pacific storms will flood the west coast of America.